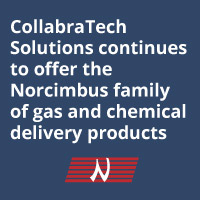 CollabraTech Solutions’ direct replacement controllers specified for use in valve manifold boxes (VMBs) are comprehensive and adaptable to meet the needs of ultra-high-purity gas delivery systems. The AVMB4S is designed to help extend life-aging equipment and be cost-effective alternatives to replacing an entire gas delivery system. The controller is outfitted with an Allen-Bradley Micro800 engine and is a 4-stick model (see AVMB8S for 8-stick model). 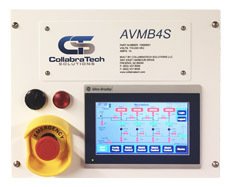 The Collabratech, AutoVMB uses a programmable logic controller with a touch screen interface to give the operator maximum control over pneumatic valve functions and updated information on valve status. The AutoVMB controller automates the operation of the four stick gas delivery system. The system provides automated dispense, vent, and purge functions for increased safety and efficiency for the operator. The system operates in automatic and manual mode and performs stick vent and purge functions on demand.